If you’ve been hankering for a taste of what Google’s got cooking with its new Fuchsia operating system (OS), just fire up your browser and head to this link. That’s where a GitHub user and developer has posted a browser-based demonstration of the Fuchsia code that Google has made available for developers so far. This is the first time we've gotten a long and close look at Fuchsia since May 2017, and a lot has changed since then. The demo, which Slashgear reports works on all browsers across devices, showcases the basic design and interface elements of the OS built on an entirely original kernel – unlike the Linux-based Android and Chrome OS. You can't do much in the demo, but it can track your device time and battery (if there is one), as well as your location (if you allow it). The interface then displays what will likely be the main home screen for Fuchsia. Here's the lock screen on desktop. Note the options for username login, Wi-Fi network choice and guest login. This is where you begin and end each session. Guest is the only option that works, and it triggers this loading icon when clicked. This is the home screen as it appears on desktop. Note the likely pinnable app windows as widgets, common Google services and search functions below and the search bar front and center. The center logo icon triggers a settings drawer when clicked, with many of the settings toggles seen on Chrome OS. This is how the Google search looks when clicked, with results likely to appear below those pinned functions, if the search actually worked. This is a basic app window for the email app. And, here's a generic container window for any given app. 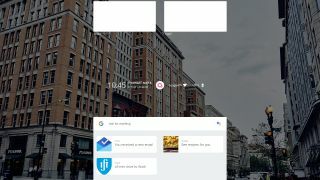 Based on this demo, which was first shared on Reddit by a user and developer known as ‘l4em’, we can see that Google search will be at the heart of Fuchsia. After logging into the demo with a Guest account, you’ll notice a persistent search bar for asking Google anything. Below that will be (probably customizable) Google cards for email, recipes (at the moment) and Maps information, like commute times. Apps seem like they’ll be pinnable across the home screen, but otherwise Google seems to be bringing Chrome OS’s influence into the picture. The final product, if it’s still known as Fuchsia by then, will look much more like a Chromebook than an Android phone interface-wise. It also looks as if search is going to dominate the rest of the OS, from finding files and apps to getting information from outside the confines of the computer. At any rate, consider us excited and cautiously impressed by how Fuchsia appears to be coming along.